In this photograph we see a young Parisian couple dining at a sidewalk cafe in the Latin Quarter of Paris. The Flagrant Delice specializes in French Cuisine. The photograph illustrates perfectly a classic example of the juxtaposition of old and new and east meets west. Notice the male figure in the picture is probably one generation older than the female. He is Caucasian and she is Asian. Finally, he is reading a book, old technology, and she is reading her cell phone, new technology. Yes, Paris is indeed a movable feast. I usually read 6-8 books at a time. I have been doing this for years and it is my modus operandi. But, every once in a while I will run across a book that is so extraordinary, so compelling, that I will stick with that one book to the exclusion of all the others. 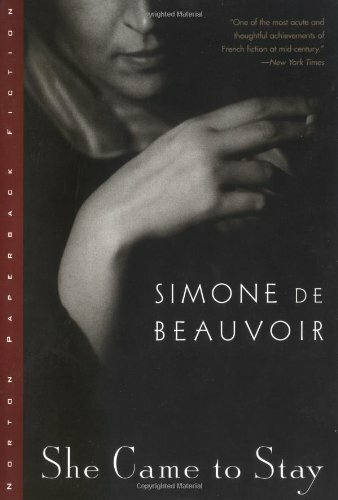 I have found the to be the case with, She Came to Stay, by Simone de Beauvoir. This is the book I chose to take to Paris with me and I am so glad I did. I have found some delightful and delicious parallels with my own life and I am sure that is part of the allure. It is a novel set in Paris near the beginning of WWII and is based on some true life events in the lives of Simone de Beauvoir and Jean Paul Sartre and the affair with a young girl that came between them. It is by turns philosophical and hilarious. It is Simone’s first novel and I love it! During the last hour of the last day of work at my last job ever, I got a call from a customer who wanted to come by and take a look at a Chrysler Town and Country van. “What time do you close?” she asked . It had been a slow day and Gidget, the sales manager, was sitting on the other side of the partition with two other sales people shooting the breeze. A little time passed and I thought I better tell Gidget I had a customer coming. “No you don’t!” She protested. “Yes I do!” I insisted. A little more time passed and no customer. The phone rings. A little more time passes and no customer. About this time the front windows of the showroom light up with the headlights of a car. “There she is now,” I said, as I started towards the front door. “I’ve done it before,” I said with confidence. So, I go out the front door and meet and greet the customer and show her the car. So we went in and sat at my desk and Gidget looked at her car and we put some numbers together and agreed on price. We had a deal! The only thing was we had to do was secure financing. So I took a credit application and told the customer we would work it out on Monday for them. She was happy and left. We all got out of there by 6:00 pm but I had to come back on Monday evening to deliver the car! Ha! That’s what I love about the car business! Just when I thought I was getting out, they pulled me back in again! It’s all good. The customer got the car she wanted and I made another sale before I left and I left on a good note and an up beat! Now I am gone and happy as a lark!